Note: DIMER is hosting the NAPX Player Spotlight interviews, written and contributed by NAPX staff. The opinions expressed do not reflect the views of DIMER. 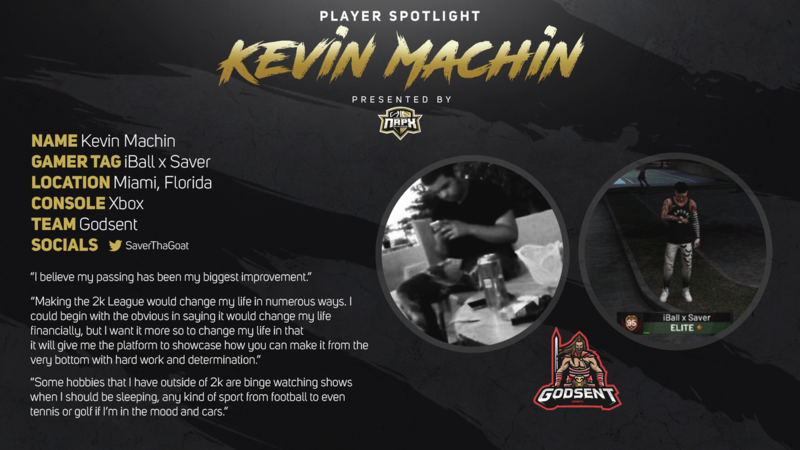 19-year-old Kevin Machin has quickly been making name for himself, starting NBA 2K19 with a bang! He has NBA 2K League dreams just like many others in the community. NAPX sat down with the one they call “Saver” to get some answers on how his NBA 2K story has come full circle. I first transitioned from park to pro-am in NBA 2k17, because me and my friends liked the idea of a 5v5 mode. But, not knowing that it was as deep as it was, I went in just to have fun. Along the way I realized how big of a community the pro-am community was and I just fell in love with the competitiveness everyone in pro-am had. Every team wants to be the best and every player wants to be the best at their respective positions, that alone was what grabbed me and I’ve never looked back to another game mode since. I actually never played basketball in real life. However, I grew up watching the game of basketball since I first watched the 2008 NBA Finals where the Celtics beat the Lakers and Paul Pierce won Finals MVP. I never played the game, so I was always one of those kids who studied the game because I loved it so much and I feel like that translated into my passion for NBA 2K, and how I understand what you can do in real life and what a virtual basketball game allows you to be able to do. There are many things in real life you would think work, but because of the game mechanics they might not always work in a simulated basketball game, and that is something new players don’t always understand. How have you grown as a player compared to last year? I believe my passing has been my biggest improvement, I feel as if this year I’m more willing to give up the ball and let someone else make a play or get an assist. My favorite NBA player for a long time has been Kyrie Irvingm since he got drafted to the Cavaliers out of Duke. I molded my game after his, meaning I consider myself an elite ball handler who can keep the ball on a string and a very elite scorer at a high level when it comes to NBA 2K. What sets me apart as a player in my opinion is my drive to be the best. I started out playing park and I’ve made a name for myself and become a top 5 player on my position with just a drive to be the best. My competitive nature is what drove me to want to become what I am now, a top PG on both consoles. I always see someone who is better or someone I can learn from, someone I want to surpass in skill and that drives me every day to get better, to be the best and to win. The NBA 2K League is the goal just like many others, but what would this mean to you specifically? Making the NBA 2K League would change my life in numerous ways. I could begin with the obvious in saying it would change my life financially, but the way that I want it most to change my life is that it will give me the platform to showcase how you can make it from the very bottom with hard work and determination. I want to be the face of the people who start playing pro-am and people don’t pay them any mind, until they start beating the best of the best and they get to where they want to be eventually which is the league. If a NBA 2K League manager were reading this, what would you want them to know most about you? The main thing I want to tell a manager considering picking me in this year’s NBA 2K League draft is that I will never be complacent, I will always strive to be a better player and to be the winner that whatever franchise picks me deserves in the long run. I will give it my all for whichever franchise picks me and that will never change. On the other hand, why would someone enjoy having you as a teammate if given the opportunity on the court? The thing that drives me to be the best player and teammate is simply the fact that I want to win. Simple as that, I want to be a winner at whatever it takes and molding myself into the player I am today is what helps me achieve both those things. What are some of your hobbies other than NBA 2K? Some hobbies that I have outside of NBA 2K are binge watching shows when I should be sleeping, any kind of sport—from football to even tennis or golf—if I’m in the mood, and cars. Thanks for your time Saver, and good luck the rest of the way!